Discover the difference between an ice-breaker and a GREAT BEGINNING. The stage is set. The crowd gathers. As the appointed time draws near, anticipation grows. What happens first creates the foundation for the main event. Often we throw away the first few minutes when we could create the mood and whet appetites for what follows.You'll leave wanting to implement a great beginning at your very next presentation. WHO: Learning and Career Professionals in organizations. WHAT: Do you struggle with great beginnings for your workshop, course or presentation? WHY: Prepare to launch your next event with a splash and create energy and involvement! HOW: You will get ideas, hear examples and participate in session starters. You will leave this session with a clear understanding of how to differentiate between an ice breaker and a great beginning, explain the three principles of great beginnings, and describe two types of great beginnings. 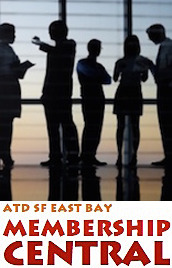 Terry Teplitz designed, facilitated, and debriefed dozens of great beginnings for the Silicon Valley ASTD Chapter. As principal of Teplitz Learning Solutions Terry provides instructional design, classroom delivery, and blended learning consulting. Her career is guided by a pioneering spirit and the drive to have a positive impact on the lives of the people around her. Customers appreciate her high impact exercises and case studies, creative approaches, easy-to-Facilitate programs, “just enough” technology, and storytelling (an especially valuable tool for case studies or examples). Terry’s employers and clients include Cisco Systems, Hewlett Packard, Lockheed, Lam Research, Wells Fargo, NASA, Pet Net, Music for Minors, and the National Highway Institute. She has spoken for ASTD, ISPI, The Executive Briefing Center at Cisco Systems, and for others on Debriefing Case Studies and Simulations, Working with Learning Technology Vendors, Mentoring, Virtual Teams, and E-Learning. Ms. Teplitz has an MA in Educational Counseling with an emphasis in Career Development, a BA in music and an elementary credential. She can be found leaving her Mountain View home to sing in a large choir, see Giants games, travel, or go wine tasting.